Only ground transport 25m (82 ft) sailing catamaran. Please note that this is a sailing catamaran, and the skipper will be using wind power when the winds are agreeable. 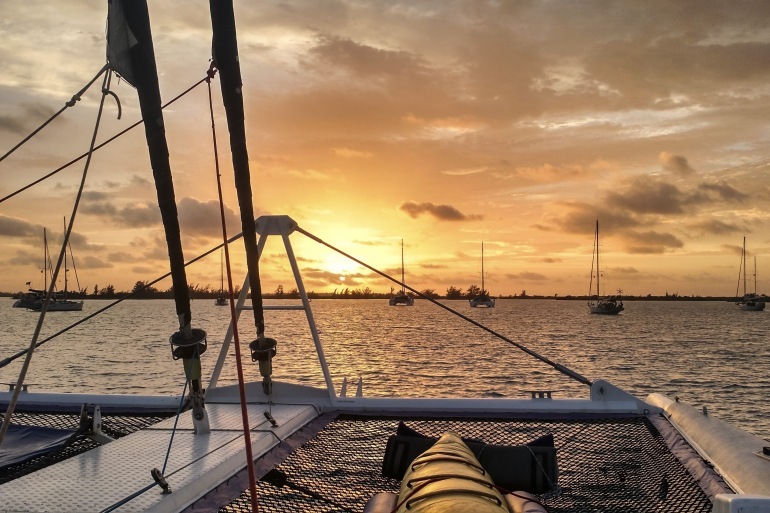 Although this is not a learn to sail program, you may have a chance to learn a few tricks of the trade and assist the skipper with navigation while sailing. There are times when motoring the catamaran will be required, due to unfavourable wind conditions. This catamaran is equipped with 8 passenger cabins, some with 2 beds (upper and lower) and some with double beds. All cabins have attached bathrooms with showers (shared between two cabins) and the vessel has an onboard kitchenette, interior and exterior common areas, and plenty of outside deck space. Power onboard is 220V on European 2 pin sockets. Please note that this is not suitable for sleeping aid machines, as the power source may not always be operating. Bringing a battery pack is recommended. If you are traveling alone, you will be paired up in a cabin with another traveler of the same gender. Please expect the cabin to be very small. The bunk length is 1.8 meters (6ft) with limited head height and limited storage for luggage. Most of our sailors tend to spend very, very little time in their cabins, just using them to sleep and store clothes. Guides Chief Experience Officer (CEO) throughout, skipper and assistant/cook. 1. Please note that space is very, very limited on the boat and especially in your cabin. It is important that you only take on board soft sided luggage such as a mid sized backpack or soft duffel bag, keeping your bag's weight to less than 15kgs. Suitcases are not appropriate for our Sailing Cuba Adventure as they are not pliable enough to fit into the niches available for luggage. If you are on a longer trip, it may be possible to store excess luggage for one week at the yacht marina. 2. Fresh water is very limited on board, and as such we ask for your understanding that showers are limited to one quick shower per person a day. One towel per week is provided for showering purposes, and beach towels are also provided. Drinking water is provided free of charge on board the yacht. 3. It's important to note that the beds in the cabins are not the usual length of a standard bed. The length is approximately 1.8 meters ( 6 feet) 4. Please let us know of any food allergies & requirements when booking, as there is very limited access to additional food once on the water. 5. 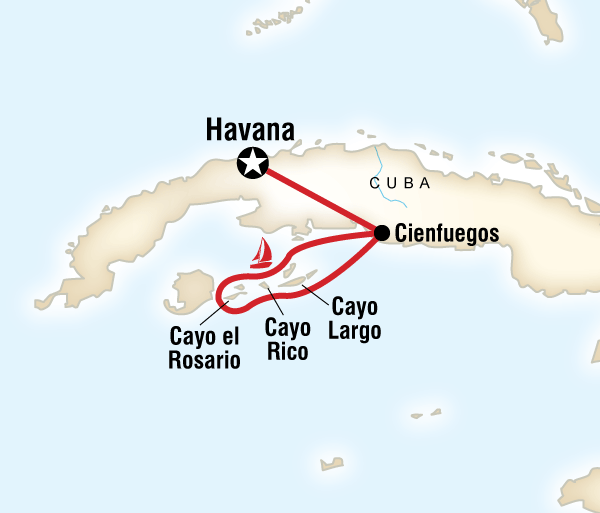 The CUC12 or EUR12 per day Cuba Sailing Tax is included in the trip price. 6. Please note that debit and credit cards that are issued by American banks are not accepted in Cuba and will not work at ATMs. In addition, it is recommended to contact your bank to advise you will be travelling in Cuba regardless of your nationality, as local ATMs are likely to block your card unless a travel notification has been set up. 7. MEDICAL TRAVEL INSURANCE From 01 May 2010 all tourists entering Cuba will require “Medical Travel Insurance” that is on a Government approved list. We urge you to check with your insurance provider to ensure your policy is on the list of approved providers. If it is not, tourists will be forced to purchase a Government approved policy on arrival in Cuba. The cost of buying this insurance in Cuba will be in addition to any insurance already purchased, and it is likely the rates for these polices will be inflated compared to what you may purchase in advance from home. G Adventures has insurance policies available for travellers from a number of countries at competitive rates, and our insurance provider has been confirmed as recognized by Cuban officials. We can assist with medical travel insurance for residents of the United States, Canada, and Australia. If you would like peace-of-mind and to purchase insurance from G Adventures, please contact our reservations team on 1800 465 5600 (from North America), or 08444 101030 (from the UK) or 39413 5820 (from Australia) or experience@gadventures.com COMBO TRIP Please note that this tour combines with other G Adventures tours. As such, the staff and some travel companions on your tour may have previously been traveling together with G Adventures, prior to Day 1 of your tour. Likewise, some staff and travel companions may be continuing together on another G Adventures tour, after your trip concludes. Eating is a big part of traveling. Traveling with G Adventures you experience the vast array of wonderful food that is available out in the world. Food is a major part of this sailing adventure. You will enjoy many home cooked meals lovingly prepared by our on board cook. Portions are generous and will include sea food, typical Cuban dishes and even the occasional breakfast fry up. Drinking water is provided and beer, wine and soft drink is available to purchase at cost price aboard. Non included meals are taken ashore at local restaurants. There's nothing left to do but kick back and relax!